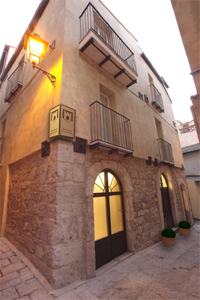 The apartments and rooms have been constructed using reclaimed stone dating back to 1600. 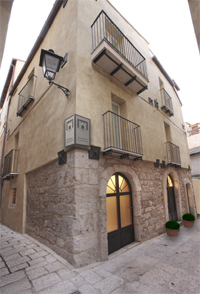 The property makes up the final section of a larger residential building in the historic centre. Having for centuries (until 1990) been a typical house, the entire building was recently salvaged and restored to become tourist apartments, in keeping with the original architecture and local tradition, highlighting the architectural features of the period. The interior design is also in keeping with a bygone era. The architectural style is typical of Isernia’s historic centre: Houses lined up next to each other to create, with later additions, insulae of buildings varying in form, structure and height, arranged in a comb pattern from the central axis represented by Corso Marcelli, served by perpendicular alleyways; some alleys join up to historical streets (Via Occidentale and Via Roma). During the reconstruction, everything possible was done to preserve the historical architectural style of the original building despite it being turned into tourist apartments. The volume of the building has not been altered, and neither have the formation or formal and environmental features, but they have been transformed using a systematic combination of internal work aimed at enhancing them and creating tourist accommodation. The building was completed using the latest technology in order to guarantee maximum safety. Thus measures were taken to render the building suitable for its new role: Interior and exterior restoration, restoration or repair of floors, the set up of facilities and systems. The whole building, designed and run with energy saving in mind, has safety regulated installations, heating with controllable thermostat in rooms, air conditioning. It also has all safety features such as emergency lighting, safety exits, night time warning lights, illuminated light switches and an automatic gas cut-off system. Expert local craftsmen have managed to breathe new life into old stone walls and arches, and cleverly restored the original stone and terracotta floors on the ground floor as well as the antique furniture. The bedrooms all have parquet flooring; wood fixtures and shutters have been made from scratch from the original designs. Every feature is in keeping with the rural style, with attention to detail also in the decorating style.